Manufacturers have tended to design cordless vacuum cleaners to be unconventional. Just look at the previous cordless offerings we've reviewed from Dyson and AEG/Electrolux. However, Vax have just launched this, the Vax Air Cordless, a cordless upright that actually looks like a conventional full size upright cleaner. This could lure consumers who previously had trepidations about the idea of a cordless cleaner; but are the more unconventional and purpose built cordless entries actually better? Unmistakable Dyson design characteristics are visible throughout this cleaner, such as the see-through removable bottom release 1.05L waste bin, no loss in suction cyclonic technology and inspired grey plastics, with subtle blue for balance. We're definitely not going to complain, because it's a vacuum cleaner that you wouldn't mind people seeing you push around your house. The plastics are reasonably rugged and the Air cordless has a bumper along the front of its head, so as not to cause damage and/or leave marks on objects you may unintentionally run into when cleaning floors in your home. So far as usability is concerned, we only have one tiny complaint and this is that the on/off button doesn't actually function unless you press it down with quite a bit of force, but we've become used to this. We generally admire the agileness of the Vax Air Cordless. Little wrist movement is needed to swivel the cleaner around, so it feels ironically airy in use and doesn't leave wheel lines on carpets. The lack of a chord succeeds in producing pure nimbleness, and in so doing yields a different psychology of cleaning. For example, when something like a little spill of flour onto the kitchen floor happens, it may feel like too much trouble to carry a chorded cleaner to the event, unwind the chord and find an outlet to plug it into. But in such scenarios, the Vax Air Cordless is the ideal speedy option. So this makes spot cleaning a simple thing; chordless cleaners really are an ideal incentive to clean up those odd messes. The total weight of the Vax Air Cordless is 4.6KG, so it's no chore to carry upstairs and is very easy to use in such scenarios too, as despite its lightness the weight distribution keeps the cleaner stable. For instance the head of the cleaner is slim in height, it's no burden to get underneath furniture easily (in certain circumstances the cleaner's entire body, which is able to touch the ground, can crawl underneath higher furniture). This turns out to be very important when the hose is in use, as we wouldn't want to topple the cleaner over every time we tugged it. 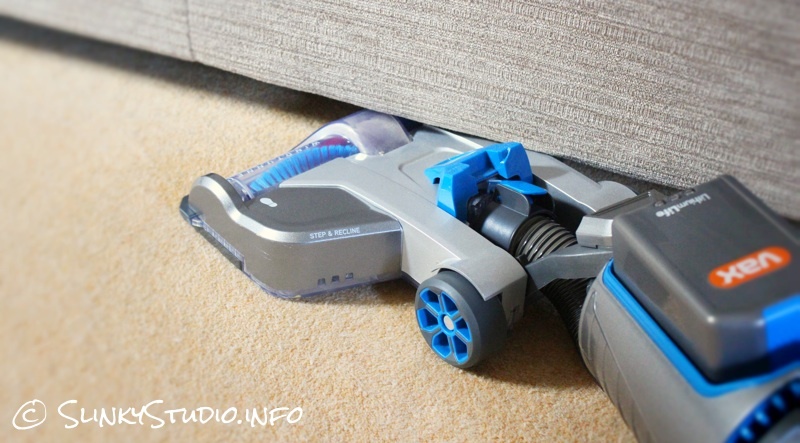 In fact, hoses often aren't a feature on cordless vacuum cleaners, which is why designs such as the Dyson DC44 cleaner which we've previously reviewed have come to fruition. 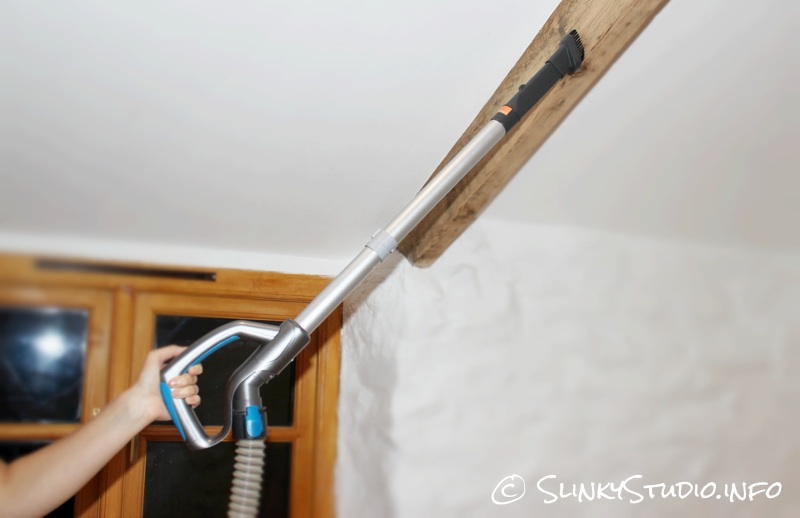 For higher areas, such as ceilings or shelves you might want to clean, the removable wand, which also doubles as the handle of the cleaner, can be attached onto the hose, and this works well. There are two tools included (2-in-1 dusting/crevice tool and a dedicated softer dusting tool) adequate for brushing over and cleaning furniture or compact areas, but only one can be stored onto the Vax Air Cordless when not being used. 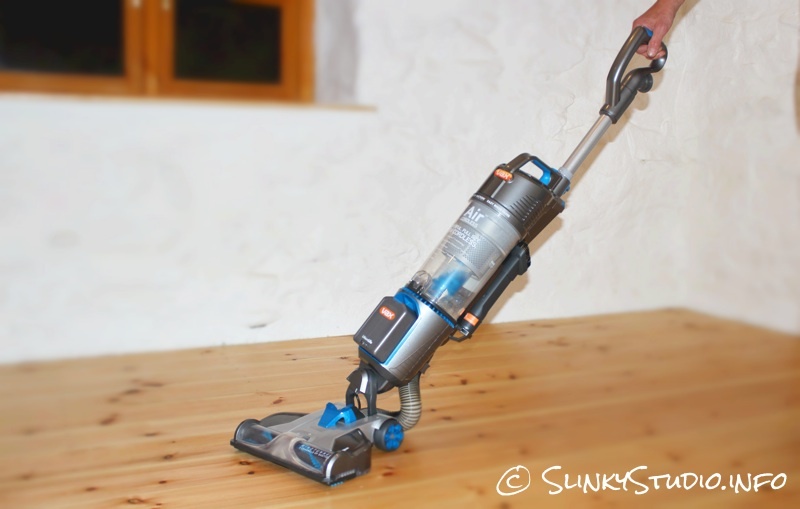 Vax have made sure this cleaner is usable on hard floors because the brush-bar can be turned off with the click of a button, which also prevents unnecessary battery drain. 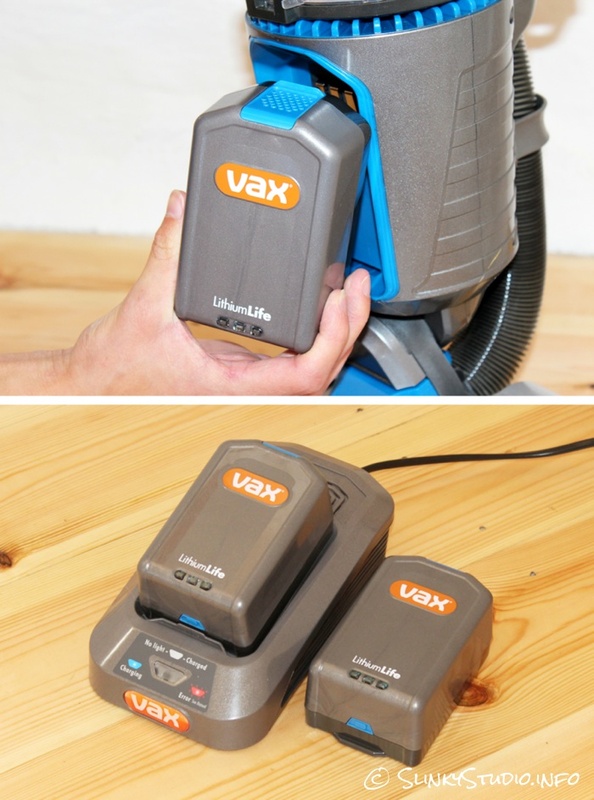 We've been using the Vax Air Cordless on both carpeted, tiled and wooden floors. The performance from this cleaner is nothing short of brilliant and we've been fully satisfied by its cleaning attributes on all surfaces. We're led to believe that WindTunnel® 3 Technology, appearing in cleaners from the group of which Vax is part of but never previously actually in a Vax, is the reason for its great performance on floors. What this technology does is to direct air suction in three different channels of the cleaner's head: or, in the real world, it means the suction can deal with very fine particles such as talcum powder embedded within a carpet or wood dust on a hard floor. We found it had no challenge with fine wood dust on two to three passes, although due to the quantity of dust, the reusable rinsable filter had to be cleaned afterwards. Flour embedded into a carpet required the engagement of the brush bar, and only required two passes for the Vax Air Cordless to clear it completely. Against walls and flat upright surfaces the Vax manages to scoop up dirt and debris from suction produced from the sides of the cleaner head. Interestingly Vax haven't built in any variable power options, which is something we're used to seeing present on cordless vacuum cleaners. 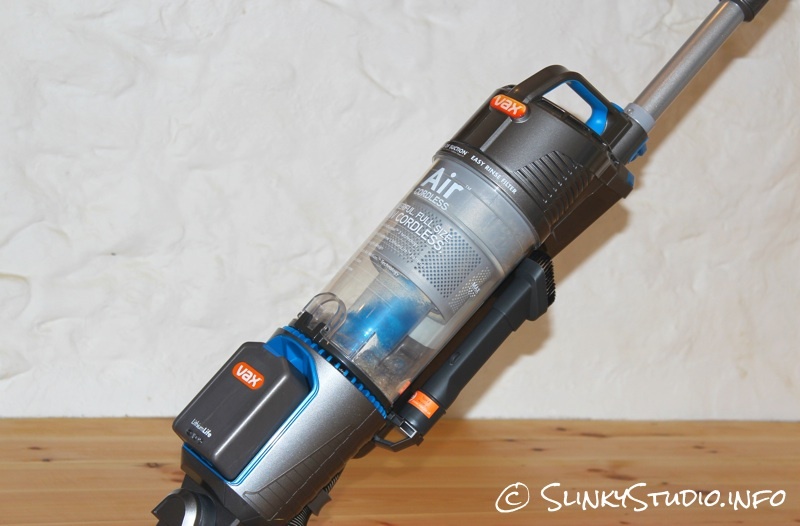 This shows Vax want you to use this cleaner like an ordinary upright with full power at all times, but it is one of the more noisy cordless cleaners we've reviewed because of this. Although only one battery is used on the cleaner, it comes with two 20V Lithium fade free batteries that have a combined claimed usage time of 50 minutes, and from our testing that is completely accurate. 50 minutes is enough time to clean a medium to small home and if your home requires more time to complete its clean, the two battery design will no doubt help with this, as one can be charged while using the other. Swapping over a battery once the power has diminished is very straightforward as they simply clip into the front of the cleaner's body. However, because the batteries can only be charged separately on the LithiumLife Charger, the cleaner can't be neatly docked in a house like most other cordless vacuum cleaners we've reviewed. Vax have gone in a totally different direction with the Vax Air Cordless vacuum cleaner. We think it's a brilliant and very capable cleaner for people who want to get rid of the chord but still savour a traditional upright design with a hose, and added to this it also comes packed with serious cleaning performance and a respectable battery life.